Bali Activity Special Price offer by Only Hiro-Chan group! For active people! 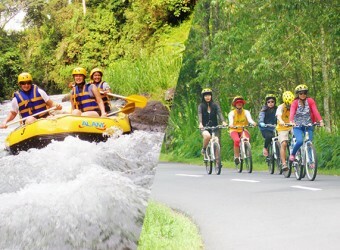 In this tour, you can enjoy cycling and rafting in same day! For cycling, they will guide you total 25km around Kintamani until Teragawaja. For the rafting, you can enjoy Teragawaja river where most strong current river in Bali! Its also include coffee tasting and lunch buffet! You will feel satisfied through this tour! Return transport, Welcome drink, Guide, Towel, Lunch, Dinner (Cycling + Rafting), Safety equipment, Maximum US＄50,000 Insurance. Change clothes, Sun block, Hats, Camera, Small amount money. ※1 person can use free transport. ※Pick-up or drop-off to airport is not available. ※ Transport is offered by sponsor activity company. You might share a transport car with other guests. ※Transport car pick-up guests in other hotels, so pick-up time might be changed. Cycling Visit Balinese private house, temple, etc. 19：30～20：30　Arrive at hotel Thank you! ※The schedule above is approximate time. It might be changed depend on condition of the day. Transport is offered by sponsor activity company. You might share a transport car with other guests.